Look after what we have got. Freedom, what is it? Is it something we find? Is it something we fight for? It could be, but here we talk about freedom as something we build for ourselves in our own lives everyday. It was a windy, wet Wednesday. The sound of the angry sea crashing over the rocks was not even audible over the noise of the lone excavator as it crushed and smashed the last remains of what was the Seaview Hotel. Like a deranged beast, like an angry elephant, swinging left and right with its devastating mechanical trunk. The once gracious and manicured Minhetti was no more. 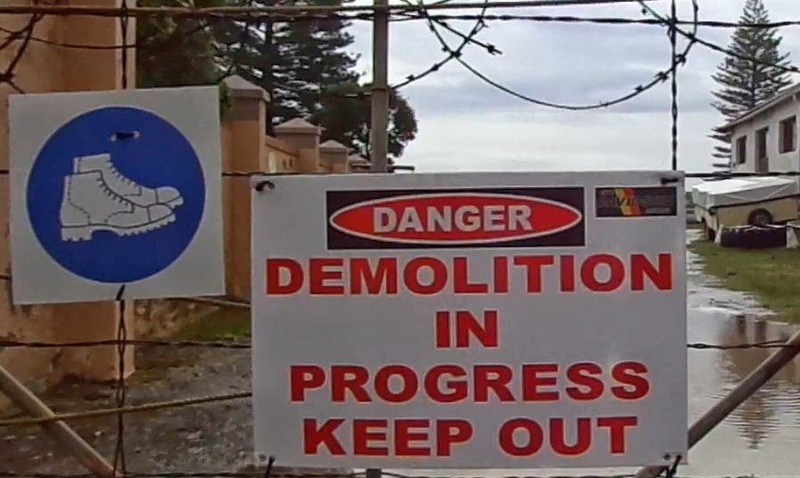 My son sat in the car, dry from the rain, as I stood by the gate, by the sign “Dangerous – Demolition in Progress”. I was not sad nor sentimental, not angry nor frustrated. I did not really even like the Seaview Hotel all that much the once or twice that I had been there. But I was filled with and uneasiness that stirred somewhere deep inside my innards. Over the course of my short life I have not yet been able to figure out what these deep feelings of uneasiness mean, or even whether they are of any significance. I have learned though, that it is normally I sign that I should step back and ponder. So here I sit, this morning, pondering over a fine Cappuccino in an average mall café. I am sure each and every one of us has a best building or favourite neighbourhood, about which we are sentimental. But not each of us has a newspaper column in which to talk about it! So, without any shame, I tell you: “Now is the time to take action to save Central, Port Elizabeth.” Framed by Govan Mbeki Avenue, the Baakens Valley, Rink Street and Russell Road, Central is home to the most extraordinary collection of rich and poor, young and old, sinner and saint. All framed in beautiful avenues, delightful squares, quaint lanes and irreplaceable buildings. How long will those of us that find meaning in Central wait before we find the energy to stand up, make a noise and take action? Will we wait for the last heritage cottage to be burned by damp and freezing vagrants? Will we wait for the last antique shop to flee to Walmer? Will we wait for the last coffee shop to tire of hastily hosing vagrant urine of its veranda every morning before the first customers arrive? Will we wait for the last office dweller to driven to Newton Park by the grime, dirt and continuous harassment by street people, drug dealers and petty thieves? When the last housewife, loses her last child in the hip high grass in any number of once perfect parks and playgrounds? Will it be after the bulldozers come, to clear the land, to flatten the monuments? Will it be then that we say “But how could “they” do this to “us”? How can “they” rob “us” of this enduring example of how city living can be tolerable, bearable and even enriching. How can “they” rob “us” of this model of authentic living that was our only contribution to the country’s emerging thinking on the future of the city? I am sorry my friends, but I must offer to you that we are all delusional. Sadly we have come under the spell of a compelling lie, a myth that there exists such a thing as an “us” and a “them”. We can understand why the politically powerful may find it useful to perpetuate this myth, but it serves no purpose when we are needing to get things done. Right now, the thing that I am motivating, needs to get done, is that we save Central. If you are with me, then let us agree on one action we can take right now, as you put down this newspaper. Go find out more about the excellent initiative underway right now to establish a Special Rating Area (SRA) for Central (basically you pay a bit more rates to get better cleansing, security maintenance etc.) It’s a “no brainer. SRA’s have been set up all over South Africa and the world. Jo’burg’s got them. Richmond Hill has just set up an SRA, proving it can be done in our region. If you do not live, work or invest in Central, all is not lost. Make a point of having a coffee in Parliament Street once a week. Make a point of buying an antique in Lawrence Street once a month, make a point of taking your kids to the Donkin Reserve once a term, make a point on attending a church service once a year in any one of the most beautiful Gothic revival churches. The point I make is, that our energy can be much better spent by expending it before the demolition than after the demolition. Great article. It's true, and not only of Central, PE. Well written and well said. I love living in Central and view my house as my piece of heaven on earth !!! We are also trying very hard to get the CPF (Community Police Forum) for Central up and running and need involvement from residents and businesses alike. Central is a very special place to live and work. I was privileged to take my toddler son to the same park to the swings and round-about I was taken to as a toddler and he is now 25 years old. Although there are some changes, it goes through ups and downs and thank goodness there are people like Tim to help lift it up again and see its richness as a very special urban environment. 27 Years ago when I likewise took an active interest in Central we promoted it as the 'heart' of Port Elizabeth…. The champion at that time was Prof Danie Theron amongst others.